BASHIR, Iraq —A group of Kurdish men arrive at sunrise, at an undisclosed location in Kirkuk Province, just steps behind the front lines of battle. They work quickly in the sweltering heat. Explosives are carefully piled in trenches and tied together so they will all blow up at once. Then, after a successful detonation, the men bow their heads for a moment of silence, to remember a colleague who died the day before, more than 180 miles away. But these men aren’t soldiers. They are a demining team made up mostly of Kurdish civilians. The man they remembered was a British national who had been in Ramadi, a city west of Baghdad, who had been attempting to deactivate an unexploded device when it blew up and killed him. 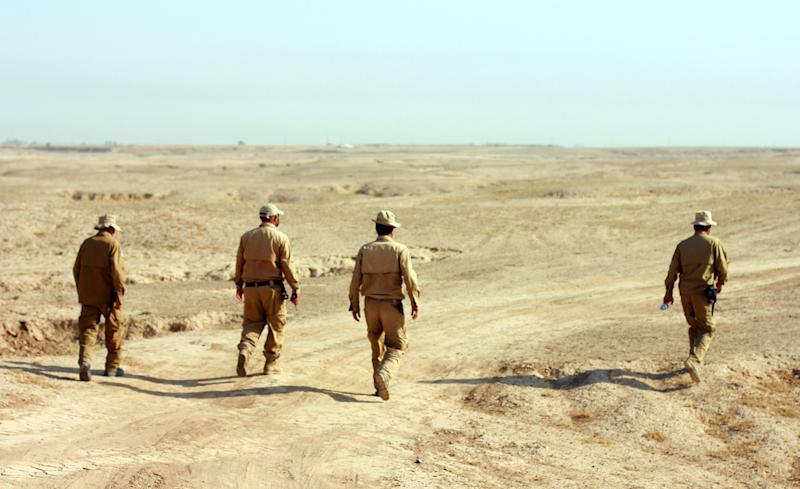 Demining teams in Iraq work to clear bombs, mines, improvised explosive devices (IEDs), and unexploded ordinance (UXOs) left in territory recaptured from the Islamic State. Their work is personal. Some have lost friends or loved ones to ISIS; others want to do their part to make sure their country is safe again; some just need the work. There are at least three million internally displaced people in Iraq, according the United Nations Office for Coordination of Human Affairs (UNOCHA). But before people can go home, it is up to mine-clearing specialists to inspect and clear towns and villages of explosives. 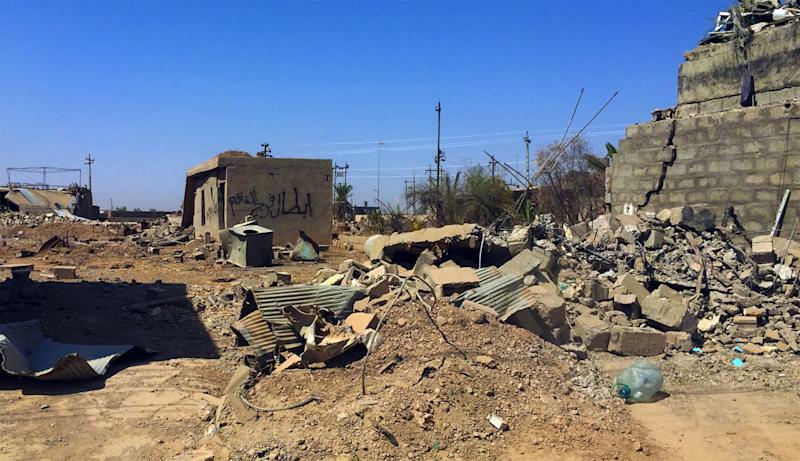 In the town of Bashir in Kirkuk, a community of Shia Turkmen was forced to flee when ISIS took over in June 2014. But in May, Bashir was liberated by joint Peshmerga forces and Popular Mobilization forces, which are typically recruited from Shia Muslim communities. The battles have left the streets like a ghost town. Clouds of dust swell up as military vehicles drive through. And with the exception of a few police keeping watch, no one is home. Many structures in Bashir have been flattened by coalition airstrikes. Bullet holes adorn the walls of homes and businesses. Despite the heat, an older man and several young teenagers sit out on blankets in front of a building reduced to a pile of rubble. One of the boys, Hussein, told Yahoo News that he came back to try to rebuild his house. 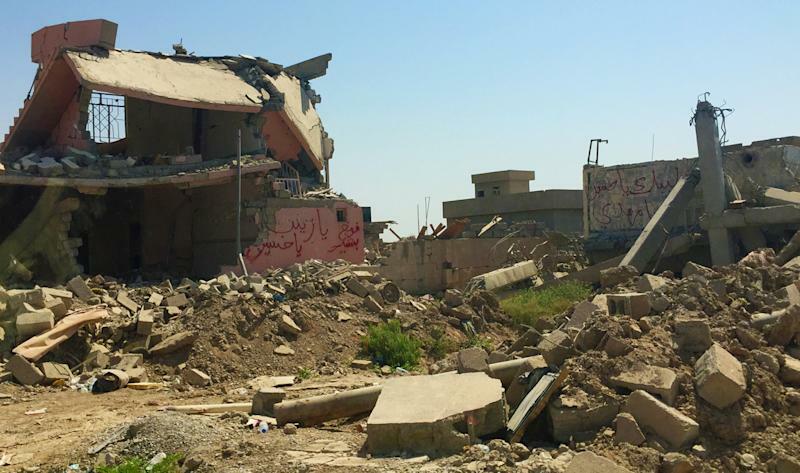 Many Iraqi displaced are desperate to return to their homes, and some will still come back just to see what is left. A team from the Swiss Foundation for Mine Action (FSD) was able to enter Bashir in July. Guarded by Shia Turkmen militia on one side and Kurdish Peshmerga on the other, they have been working to clear the area of explosives. Demining is a humanitarian mission. The U.S. State Department funds several global demining organizations. In 2015, with congressional approval, it made grants of at least $25 million to groups working in Iraq. “It’s a fine line between military and civilians,” a State Department representative in Washington, D.C., told Yahoo News. “[On] the humanitarian assistance part, we have a lot of coordination meetings together. We rely on our military colleagues to provide an update.” Before civilians can be sent in to do the work, military operations have to be complete. “What we are coming across, mainly, are simple IEDs being used as an improvised land mine,” Van Roy told Yahoo News. “Where a land mine may have been used in the past, they [now] have had to improvise,” using the materials available to them. The FSD trains Iraqis in the delicate work of detecting explosives, removing them and disposing of them. The dangers of the job are evident. Once the metal detector discovers a suspected explosive, the area is secured, and demining teams attempt to deactivate the device for safe transporting and detonating. Some are explosives that were never set off. Others were munitions that did not explode when they landed. Both pose potential dangers, and the demining teams are at risk of death when they attempt to deactivate them. A Kurdish team leader for the FSD, Loqman Mala Husan, said he lost a friend and co-worker a few months back during a demining operation. “He was a very funny man, we liked him, it was bad for us,” he said. The British worker who died in Ramadi worked for a group called, Janus, another organization receiving assistance from the U.S. government. U.S. State department officials say that when someone from an American-supported organization dies in the line of duty, they offer compensation to their families. 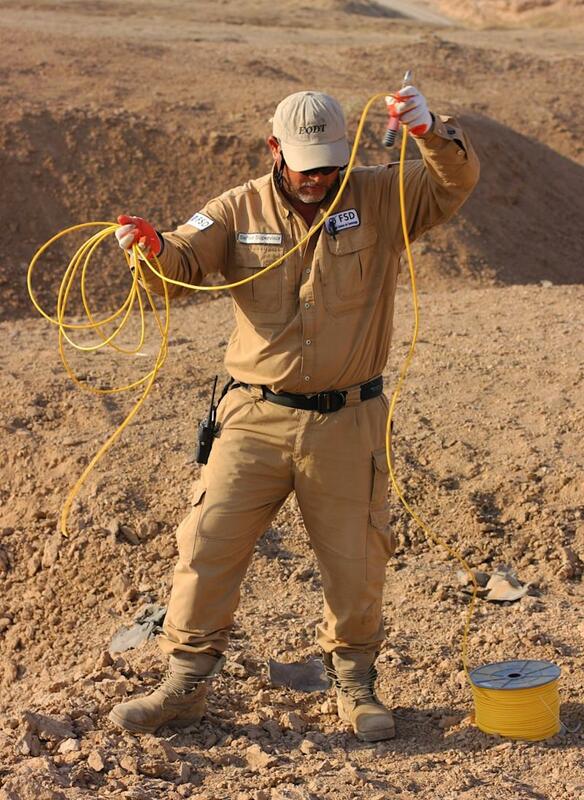 Once the devices are rendered safe, they are taken to another site behind the frontlines and put in trenches. On Wednesday, as fighting subsided along this section of the front, the demining team went to work. A red marker on the horizon showed where ISIS fighters were dug in. Each of the devices were constructed differently: some in metal cans, others in plastic containers. After rigging the explosives together, the men, already covered in sweat and dust, pause to eat breakfast of beans, bread and Kurdish tea. They give the detonation button to one of the men for safekeeping and spread out to safe areas, including the Peshmerga’s fortified hill. Over the walkie-talkies, the countdown can be heard, then a moment of silence before a booming sound erupts from the site. Plumes of smoke rise into the air and dissipate into the blue skies above the frontlines. So far, the demining team has cleared over 54,000 square meters of land, about 13 acres. It has discovered 179 IEDs and 31 UXOs and still has a long way to go. 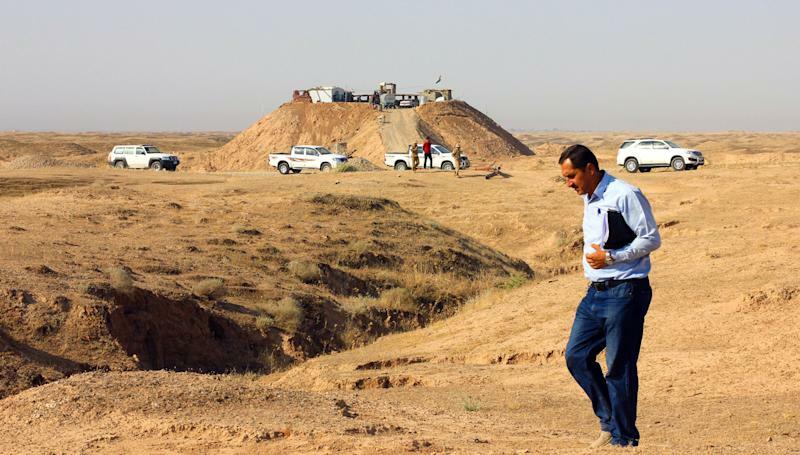 After clearing explosives from the farmland that was once a battleground for militia fighters and the Iraqi military, demining teams will eventually make their way into Bashir itself, sweeping structures to make sure displaced residents won’t step on an explosive when they return home. ISIS has been suspected of setting booby traps in children’s toys or creating trip wires. Van Roy said he has seen near-misses when a resident returning home comes close to setting off an IED. “Those people, besides putting themselves in a risky situation, are also sometimes very good sources of intelligence about where items might be,” he said. Some are former fighters, others farmers trying to start life again on their land. While demining teams work to make the liberated cities and towns safe again, it is a slow process, and it is difficult to keep desperate civilians from their homes. After waiting so long, many displaced are ready to go back and risk their lives just to rebuild from the rubble.